As I’m sure many of our readers have noticed; the internet is filled with Herschel lookalike backpacks from brands that are offering similar design at much cheaper prices. One of the most popular Herschel lookalike brands is Kaukko. Popular on Amazon, and other e-commerce platform sites, the Chinese brand has made it a business to copy Herschel’s most popular bag designs. We wouldn’t be interested in this comparison if the prices weren’t so drastically different. While Herschel’s Little America retails for $100, the Kaukko Classic sells for around $40. That’s a hefty difference in price. But is there a big difference in design and quality? Let’s find out. Before getting into the size differences let’s note that we are comparing the full sized Herschel Little America and not the smaller “Mid-Volume” version. When comparing the two backpacks on paper you will see that the Herschel backpack is slightly larger in size. The Kaukko backpack comes in slightly smaller in dimensions and also slightly smaller in carrying capacity. While the Herschel can carry 25 liters, the Kaukko has a carrying capacity of 22 liters. But even though the two backpacks are different in size, you really can’t tell the difference when they are next to each other. You can’t even really tell the difference in size when wearing the backpack either. They both look and feel about the same. So it’s obvious Kaukko has borrowed heavily from the Herschel Little America design. So much so that at first glance they seem identical. It’s not until you look closer that you start to notice small differences. The most obvious difference between the Herschel Little America and the Kaukko Classic backpack is in the pocket count. Herschel enjoys keeping it simple and true to an original rucksack design by providing fewer pockets while Kaukko leaves no wasted space by stuffing additional pockets wherever it can. Kaukko takes the liberty of adding two side pockets on the outside of the backpack. Each pocket is paired with a compression strap that allows you to cinch down whatever is inside the pocket. The Herschel Little America has no side pockets at all. Inside the main compartment is where the difference between Kaukko and Herschel really stands out. Both bags feature a fleece-lined padded laptop sleeve and two side pockets. These side pockets are what Herschel calls their “internal media pocket”. The pockets are just large enough to fit a phone or power bank and the one pocket is accompanied by a gusseted port for your headphones or charging cable. The idea is that you can port a cable through this hole and keep a device in this inside pocket. This cable port is a feature that Kaukko does not have. Kaukko not only has a padded laptop sleeve and two side pockets but they also have two additional pockets inside the main compartment. This gives Kaukko a total of 4 internal pockets plus a laptop sleeve. Unlike the Herschel backpack there is no cable port hole to use for headphones or charging. As for laptop carry the Kaukko laptop sleeve is advertised as fitting laptops up to 15.6 inches. And the Herschel laptop sleeve is advertised as fitting laptops up to 15 inches. But what we found is that both laptop compartments are identical in size. The padding is also very similar and there is little difference between the two brands. The Herschel padding doesn’t feel any better than the Kaukko padding and vice versa. There isn’t too much to say here in terms of design differences of the front pockets. Both bags feature a big empty zipper pocket on the front of the bag. The main difference here is that Herschel includes a key clip for your keys. But other then that the front pocket is nearly identical. According to the fabric tag inside the Herschel Little America, the backpack is made out of 100% polyester fabric. Kaukko also advertises their bag to be made out of polyester with a more specific description of 600D Polyester. Although Herschel does not advertise their denier, both fabrics feel identical to the touch and look incredibly similar in person. Now this is really surprising considering how much more expensive the Herschel Little America is when compared to the Kaukko backpack. If you were to do a blind test and feel both backpacks without seeing them, they feel exactly the same. Which is pretty crazy considering the price difference. We are willing to bet that both brands use the same polyester fabric in each respective bag. Both Kaukko and Herschel use faux (fake) leather for their straps. The differences in the straps are subtle with Herschel’s straps being slightly thinner with a pebbled texture. Kaukko’s straps are slightly beefier and are unfinished on the one side. Overall, Kaukko’s straps feel cheaper.The reason being that they are essentially two pieces of material that are stitched together and if this stitching ever came undone that the straps would just fall apart. The lining in each bag is not significantly different. The main difference is that the Herschel lining feels softer and more like a fabric while the lining in the Kaukko backpacks feels more “plasticky”. Although Herschel’s lining feels a little better, there is not a glaring difference in quality between the two. There are only small differences in the hardware but they are worth mentioning. Kaukko uses a big branded metal zipper pull on the front pocket while Herschel uses a small discreet black metal YKK zipper pull. Herschel’s zipper is better hidden while the Kaukko zipper pull dangles a bit. The zippers themselves feel exactly the same in terms of quality. The magnetic snaps also feel about the same in quality. The only real difference is in the small details. Herschel has its brand name engraved into the metal snap which is a nice touch. There is a big difference between the two backpacks that isn’t obvious until you take a closer look at the two of them and that is in the fabric paneling. Herschel’s main body construction consists of one single piece of fabric that is wrapped around and stitched to the backpack panel and bottom panel. The Kaukko backpack is made out of three separate fabric panels that are all stitched together. This is important to mention because of the stitching. The more stitching a bag has, the more prone it is to failure points where the stitching can come undone and rips can form. Technically, Kaukko is worse off because of this construction design. Where as with the Herschel bag there are less seams and hopefully less problems down the line. But when it comes to overall construction quality we were very disappointed in Herschel’s construction. All throughout the bag we found small points of fraying and loose threads. These unfinished odds and ends are how the Herschel Little America was shipped to us. Kaukko also has similar fraying here and there. But honestly, that’s expected from a cheap backpack. At $40 you can forgive these small issues, but at $100 we expect better. An obvious difference between the two bags is that the shoulder straps and back panel padding is thicker and more structured on the the Herschel Little America. But because the two backpacks are so similar in design, the weight distribution feels about the same when you wear them so there isn’t an obvious difference in comfort. Because of the extra padding, the Herschel Little America is slightly more comfortable. You can feel the back panels more when you wear it, especially the bottom back panel. 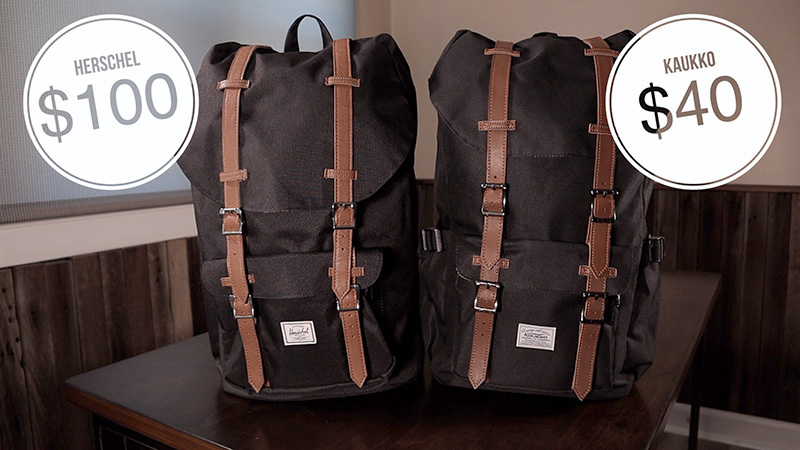 Choose Herschel if… you value an original design and the name brand. Maybe you want to support the original designers and find value in wearing a Herschel backpack instead of a blatant rip off. You also may want to choose the Herschel Little America if you want the bag with better construction. We are talking better construction when it comes to fabric paneling, less stitching that could fail over time, better leather straps, and a more padded back. Choose Kaukko if… you want a backpack that is similar in quality and design to Herschel without the hefty price tag. Kaukko took the original Herschel design and tried to find ways to make it better. More pockets and storage options is just one of the ways Kaukko improved on the original design. If you can’t live without water bottle pockets and extra pockets inside the main compartment, then Kaukko is the clear choice. Newer PostWenger vs Victorinox vs Swiss Gear - What's the difference?